Huskies' men's soccer head coach Jamie Clark talks about preparation for the season ahead, and for youth players aspiring to reach the game's highest levels. In 2011, only 34 years old when he was hired to be just the third head coach of the University of Washington's since 1985, Jamie Clark has taken the Huskies to the NCAA Tournament in two of his first three years, and led his 2013 squad deeper into the postseason than any in UW history. That team went 17-2-4 overall and earned its first Pac-12 title since 2000, then became the first team in UW history to win two postseason games, defeating Seattle University and Stanford before falling to New Mexico just one game shy of the Final Four. 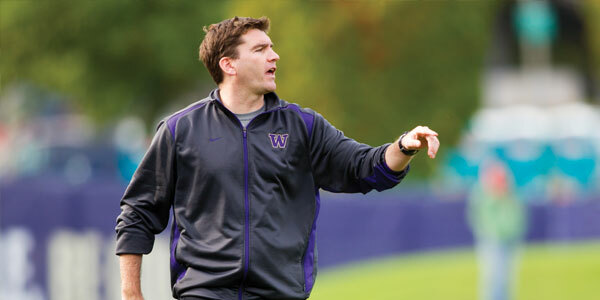 The son of legendary Notre Dame coach Bobby Clark, Jamie played three seasons in MLS before joining the New Mexico staff as an assistant coach, then going on to success as the head coach at Harvard and Creighton before arriving at UW in 2011. Recently, Clark sat down with PlayOn editor Brian Beaky to discuss the elements that make a successful soccer team, the impact of Seattle Sounders FC on the local soccer scene, and the key attributes he looks for in a youth soccer player. What are the hallmarks of a Jamie Clark team? "I want our team to maximize their ability, but have fun doing it. Guys who maximize their talent run hard, work hard, tackle. I want our team to be selfless and hard-working. And the biggest thing for me is that I want our guys to be happy doing what they're doing. Happy players express themselves on the field with an artistic approach. Guys have to have the confidence to express themselves. We try to give them creative license, as long as they're working hard. The freedom to turn the ball over trying something new, but then to work hard to get the ball back. It's a never-ending balance." With your father being a famous coach, do you think it was preordained that you'd follow in his footsteps? "Sometimes I trick myself and believe that it wasn't meant to be. I always talked about growing up and going to law school, and planned on doing that when I was done playing. It was sort of a funny turn of events. My brother was doing his residency in New Mexico and I went down there to do my rehab from a hip injury, and the idea at the time was just to be an assistant for a year and then try to give it one more go. But maybe I was just telling myself that, because it was an easy entrance that didn't require much commitment up front. But it worked out, and there's no way I'd ever change it." You had been very successful at Harvard and were just one year into your career at Creighton when you came to UW. What attracted you to this job? "My wife is from Portland, and UW was always a dream program for me. Originally, I didn't pursue it. You don't want to be a coach that just jumps around. You do have loyalty to players, and making moves like that makes it look like you don't. The one piece of advice that my dad gave me, though, was, 'No one remembers in the long term, so long as you're really, really loyal somewhere. Make sure your next move is where you want to end up.' And hopefully, I'm starting to make my name here. But that takes time, and it takes serious success." Did the vibrancy and passion of the Seattle soccer scene play into your decision? Does it affect recruits? "No one wants to give Portland credit when you're living in Seattle, but I have to say that the whole Northwest is absolutely unique. We're still trying to gain relevancy in the market, and demonstrate that we're worthy of coming to watch, too. We're working on that every day. So many people enjoy the sport, that I think we can be part of something really unique, and be a college team that draws outsized crowds just like the Sounders do. The most exciting piece for me, moving forward, with regard to the Sounders, is that when you have a product like that that matters to the city, it becomes culturally important, and soccer becomes important within the community. More kids are playing, better athletes are playing. They're playing more, because they're inspired. It means that this area will continue to produce more and more players. Our success is always going to be based on Washington kids. We're going to sign some kids from out of state, but I want kids who are proud Washington guys. The more great players that come from the state, the better that we're going to be." With MLS clubs now actively scouting college undergrads to sign to contracts, particularly those that came up through their Academy systems, does that complicate your job? "As we get better, we're going to lose more kids to the professional ranks, potentially at an earlier age. I value education, so as much as anything, I want to figure out how kids are going to finish their degrees, because they're not making millions and they're going to need to look out for their future. This year, we had three kids turn down pro contracts and come back to school. That speaks volumes to the fact that they believe that we're doing things right here and that they're growing as players, and that they're having a good time. And to the point that they want to do something no one has ever done at UW, and that's get to a final four. And they think we can do it." How important is it for you to maintain strong relationships with local youth clubs and coaches? "Those guys are Seattle soccer through and through. We're fortunate to have people like that, and I'm fortunate to have them developing top youth players. My relationships with them are crucial. It's simple; I just want those coaches to know that their kids are going to be taken care of and worked with properly. Obviously, not every kid is going to be a huge success, but you want every kid to walk away saying, 'They coached me well, they gave me every chance possible and I grew as a player.' I think if we get there, then they'll want to keep sending players our way, and keep them close to home." What advice would you give to a young player who wants to play in college? "Develop a special quality. There are so many guys who you go and watch and they're good, and then you have to decipher through good. Some guys have a lot of natural ability, and are given the benefit of the doubt. But if you're not, then the questions are, 'Are you a winner?' 'Are you the toughest guy on the field?' 'Do you have an engine that works harder than anybody else?' 'Are you a goal-scorer?' You have to have a special quality." What advice would you give that player's parents? "For the parents, it's about trying to do the best for our kids. I ended up being a soccer player, but I was never pushed that way by my father. I enjoyed it. If my daughter never kicks a soccer ball in her life, then I'll support her doing whatever it is she wants to do." Your first three years have seen a quick reversal of fortune at UW, with the team making two NCAA Tournaments, earning a No. 1 ranking, and reaching the Elite Eight. How have you managed that turnaround? "It's a two-piece thing: culture and talent. Very early on, we had some good people on board the bus already, but they weren't necessarily driving it. We got the right people in charge, and then brought in some transfers early on that were Washington kids who wanted to come home; kids that were full of pride and either didn't come because they weren't recruited or because they fell through the cracks for a few years, but wanted back in, and wanted to be Huskies. The combination of those two, plus just a little bit of talent, was enough to get us to be pretty successful. Then, with some early initial success, we've been able to grind real talent down, as people realize that this is a place where they can truly reach their goals. We're starting to turn and become a very talented team, which is exciting to see. But you can't get there without having the culture piece as well. And we can't forget the hard work ethic that got us here. That's always going to be our hallmark. We're a blue-collar team, and that's the kind of guy I want to coach." What sets the 2014 Huskies team apart from others you've coached? "The biggest thing for me is confidence. every team says at the start of the season that they want to be great, but very few teams actually believe that's who they are. They hope, but this team now believes. That belief is founded in their past successes, yet they know they still have to get better. Training sessions are tough, bordering on being overly competitive. The best players are driving the train in terms of expectations, instead of being prima donnas. And even though they're pretty young, they believe that they're pros and are going to be great players." It sounds like you're describing the Seahawks. "It's funny you'd say that. I've been waiting to read Pete Carroll's book. But I've always watched from afar and seen just how much fun his teams have always had, yet how driven they are. They're so competitive, but they love what they do. That's what I want from our team." What will be the keys to success this year? "We have to score goals, and lots of them, and I think we have the players to do it. Our two attacking players are the Pac-10 rookie of the year, Cristian Roldan and [Washington Premier FC and Sounders Academy product] Darwin Jones, who was a first-team All-Pac-10 guy. So if those are your two forwards, then you're off to a good start. Then we have a freshman who scored six goals and a sophomore who scored six goals, and those are our two wingers, so if those four just take one further step in their evolution as players, then it's going to be frightening, it's going to be free-flowing, and it's going to be fun. That has to happen. Where I'm nervous is that while we've become a better team than we've ever been talent-wise, we've lost two gritty defenders, one of whom plays for the Portland Timbers now. They were our toughest competitors. We're talented, but the question now is who is going to lead us on the field." For schedules, tickets and other information about University of Washington soccer, visit www.GoHuskies.com.